My Aunts Honey (Martha) & Dusty (Isabelle) Aunt Dusty just passed away Wednesday. They were in separable for 83 years. Here are four of the sisters - Dusty, Honey, Marie, Louise (My mom). Not pictured are Aunt Connie and Uncle Tom. There were six kids born to Anna and Alessandro. A set of twins were born still right before my Mom. Sadly, as well, is that their father died at age 39 leaving my amazingly strong grandma with six kids to raise on her own. They were raised with love and faith and tradition and Italian culture and honor. They were close and took care of one another. My Mom dropped out of school at age 15 to go to work to help out as did all her siblings before her. She worked at the Brass Shop making bullet casings during WW11. Back to my Aunt dusty and Aunt Honey. Their story, quite unique. They never married and lived with my grandmother until she died at a young age, 60. They stayed in the apartment for a while and then became housekeepers for priests. They worked as such for thirty years. They were live-in house keepers. The secrets they hold remain just that, secrets. They retired to Senior Housing in their town where they lived together the rest of their days. Aunt Honey, the youngest is now 83, Aunt Dusty was 86 when she passed. They have been together every day for 83 years. Can you even imagine? 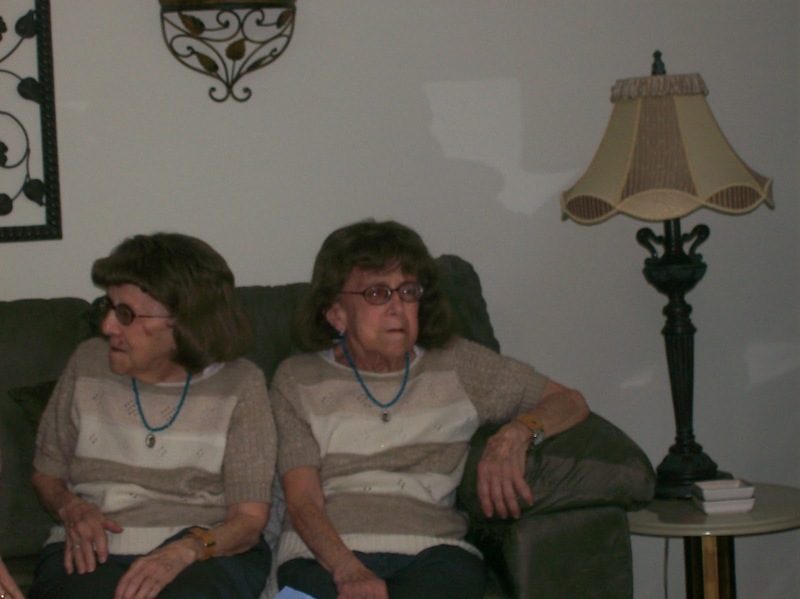 My Gram used to buy them matching clothes - so over time they dressed exactly the same. After Gram passed away they continued this tradition and always dressed exactly the same including jewelry and matching wigs. Even their food choices were identical. At any family gathering they would share everything so they each had half of what the other had - their plates were identical. I guess I could say they were a tad eccentric, perhaps odd, but at the same time it is what we knew and came to love and honor for all of their days. Aunt Honey is doing okay, considering. She has strong faith and a good sense of humor, as did my Mom. I think that is the key to life - to being happy and accepting - to settling in and doing what is necessary to meet challenges and enjoy moments every day. Three of the sisters were nic-named the "Dolly-Sisters! Connie, Gil and Louise. This came to be because at the start of family picnics or holiday gatherings these three amazing sisters would do a singing and dance routine tht always got us all on our feet in applause. Here is one of the songs they sang and danced to. Oh such a wonderful memory. And so it was that these sisters and one brother grew up strong and kind and loving and faithful. Aunt Honey now the sole survivor. God Bless her. The service for Aunt Dusty is Wednesday. We will all gather and pray and remember and honor her beautiful life knowing her next life is beginning with all of her family that passed and are forever at our Lord's eternal banquet table - she will rest in peace..... Amen..
Gail, this is a lovely tribute to you aunts. Just know that Heaven gained another angel. I remember reading about these sisters. Even though they aren't twins, they certainly look they are. They must have shared treasure troves of memories through the years. I'm so sorry that Ms. Isabelle passed away. I know that Ms. Martha will miss her dearly. Your Mom was a dear lady, working hard all of her life helping take care of family. Ms. Isabelle and your Mom are smiling together in heaven enjoying being together once again. My condolences to your Aunt Honey and to you and the family on the passing of your Aunty Dusty. I'm sorry for the loss of your aunt. You have such beautiful memories of your family! HI MUFF - thanks for stopping by and for your kind words. HI JACKIE - oh how I love your Southern style and way of saying things. Your warmth shines so brightly as does your love and kindness. Wow 83 years is a long time together...I feel for their loss. Oh My God what a beautiful post, your aunts were angels on earth & I'm sure a bond like theirs is stronger than death. HI TRISH - so glad u came by - and that u enjoyed the post :-) And yes, we are getting ready for Spring - still kinda chilly but we are ready!! You so lovingly tell of your family that I feel you are seated by my side sharing a knowing hug. Special you are for all you, with tender heart, bring to each of us. 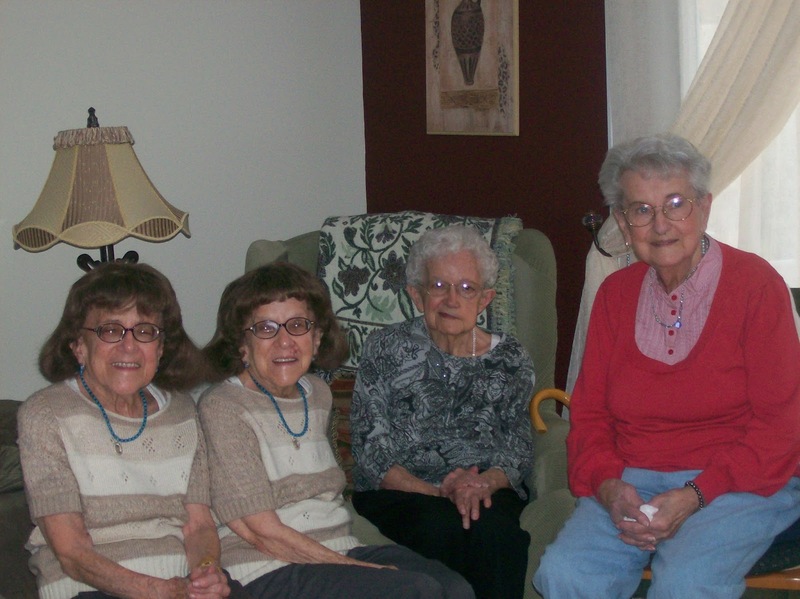 ROSEMARIE - thank you for sharing in these memories of family and love and sisters. I feel your closeness to me always.